We have several GPS devices, some are test units, some are our old standbys. Every time we encounter an issue with driving an RV on this country’s highways, we like to check out the various devices to see what they tell us to do. We often have two or three of them talking to us in different voices at each turn. We love it when they all agree. When they don’t , I tell Jim to follow the female voice … mine! Jim’s pounding heart didn’t stop his quick thinking and he moved into the left lane where the clearance was much higher in the middle of the stone arch. I held my breath until we were on the other side. Now we are in Massachusetts and, when we called an RV park to inquire about a site for the night, we were told to take a specific route. She said to go past the designated exit to the next one, then get off and take a local road for a few miles back up to the park. After safely parking for the night, we investigated the reason for the detour and discovered an 11 foot clearance bridge ( 42.668005°, -72.547709°). None of our GPS devices knew about this, they all routed us on the road where we would have been caught by that low clearance. I love our GPS devices and wouldn’t travel without one, but we have learned some important lessons over our 9 years of RV travels with GPS devices. Consult a paper map periodically, just to see if what your GPS is telling you makes sense. Review your day’s route in the GPS before you turn the key and start driving, especially the beginning – from the campground to the highway. Learn how to see the entire day’s route in your GPS before following it. I’ve heard of people traveling 6 hours out of their way before they realized that the GPS was taking them to a different ‘Greenfield’ than their intended destination. Always call your destination and verify your directions, or read the directions from the RV Park’s website or directory listing. The local park owners or staff know better than the GPS devices! It’s that last mile that is the most problematic. Any time you find a routing issue that is not correctly identified in your GPS unit, communicate that problem to the manufacturer. Garmin gives you a web form to report a map error. Google Navigation has an option at the end of your route to specify ‘”Destination Not Here.” Microsoft Streets and Trips uses Navteq maps. Here is a Navteq form where you can report a map error. Rand McNally units have a button to “Tell Rand.” The more we all communicate with the manufacturers and map makers, the better the information will become. What lessons have you learned in traveling with a GPS? Leave a comment below. Geeks on Tour is a membership website with hundreds of Tutorial Videos on topics of interest to travelers, such as using smartphones, managing digital photos with Picasa, Route-Planning with Streets and Trips, and sharing your travels with a website using Blogger. You can subscribe to our free enewsletter, or become a paid member and be able to view all of the videos in the Learning Library. Published by MrsGeek, in Blog. Tagged with low clearance, Route Planning, RV travel with GPS devices. Judy, yes a couple of them are Truckers/RV specific units. We had input our height into one of them but not the other. Some of the low clearance info was there – but definitely not all. Google Street View is the only thing I really trust … when I can see the clearance sign and read the numbers, or see that the road goes over the railroad tracks! Just curious if any of your GPS units is a “truckers” model where you can input your rig’s height and weight? I now subscribe to a “low clearance” database and have downloaded similar databases from the Discovery Owners website. We had one scarry moment on a Parkway in upper NY but was able to exit. In this case the gps was correct in telling us numerous times not to go there. Navigator error in not listening. GPS is not smarter than the avarage bear! 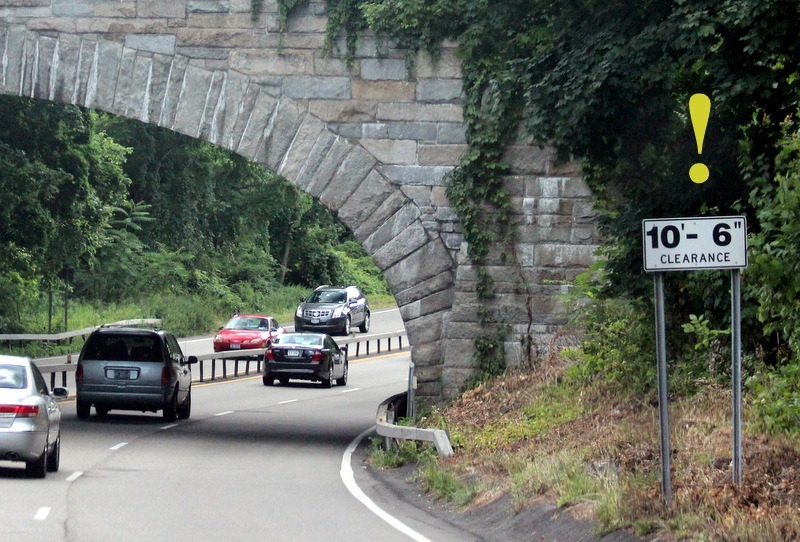 We were caught in Upper New York with 5 stone arch bridges about 3 years ago and had only 1″ to spare on either side of our roof on our 12’9″ motorhome. It was a scary lesson to learn. We also have seen numerous times that after you make a curve in the road, that is why the Highway Department places the low clearance sign with no chance of turning around or by-passing the bridge. Duh!! We’re all in a learning curve as we travel.